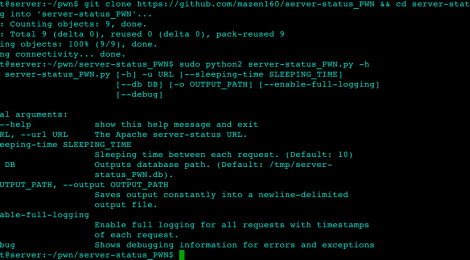 Browse: Home / server-status PWN – a script that monitors and extracts URLs from Apache server-status. Apache server-status is an Apache monitoring instance, available by default at http://example.com/server-status. In normal cases, the server-status instance is not accessible by non-local origin IPs. However, due to misconfiguration, it can be publicly accessible. This leads anyone to view the great amount of data by server-status. A part of “interesting/severe” data to long-term attackers and red-teamers is the exposure of clients’ IP addresses and requested URLs on the Apache service, which an exposed Apache server-status provides. Also, Apache server-status output is viewed on the real-time. What type of data can be exposed? 1. All requested URLs by all Hosts/VHosts on the Apache server. +-+ Hidden and obscure files and directories. +-+ Session Tokens on GET REQUEST_URI (eg.. https://example.com/?token=123). If tokens are passed through GET HTTP method, it will be exposed, no matter what SSL encryption is used. 2. All clients’ IP addresses along with URLs the clients have requested. What do we need as attackers? We need a script that constantly monitors the exposed Apache server-status, and extracts all new URLs, and save them for later testing. Also, if we are performing an intelligence engagement, we would need all IPs that interacts with the Apache server that hosts our target website, along with requested URLs. Then we need to constantly monitor the service on the hour. server-status PWN constantly requests and parse Apache server-status page for any new event. Whenever a new URL is requested and a new client IP address is used, it will be logged and reported. It outputs the data in a SQLITE3 database, and includes an option for saving unique URLs in a newline-delimited file. ← IntelMQ is a solution for IT security teams for collecting and processing security feeds using a message queuing protocols.